Submitted by Anonymous on July 12, 2006 - 6:13pm. does the deal enjoy failing peeps? Submitted by surgingshark on October 24, 2008 - 1:57pm. Submitted by JesseT77 on November 5, 2008 - 3:24am. Submitted by HybridRain on January 20, 2009 - 2:14pm. god thats a lot of stress... *bang! Submitted by kbcraigs on January 27, 2009 - 10:28pm. My friend and I are getting ready to Graduate and start college, him as an Electrical Engineer, and myself as a Chemical Engineer, and any time either of us mentions it, the other says "EVERYBODY FAILS ENGINEERING!!!" Submitted by Hydra on January 31, 2009 - 9:56pm. D= I'm getting stressed out by comic-osmosis. Er... my face is against the screen? Submitted by Ranorath on March 3, 2009 - 11:12pm. Submitted by paralian on September 22, 2009 - 5:25pm. 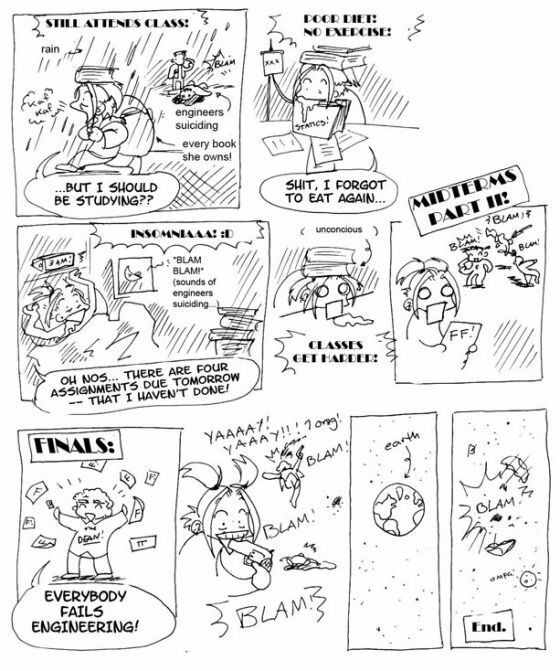 I've been re-reading these comics, and they're funnier now that I'm actually in second year of engineering. Submitted by Midnightmelody on December 16, 2009 - 12:01pm. Submitted by reynard61 on January 31, 2010 - 2:46am. Submitted by juerujin on February 8, 2010 - 5:48am. Submitted by Samuraiartguy on March 10, 2010 - 9:24pm. Gah! Crazy as this sounds, when I was at Pratt (for Design, not engineering, thank the gods... ) we actually DID have several suicides while I there there. The Architecture majors (this was pre-CAD!) were so stressed they were like on permanent deathwatch. Submitted by miasaki666 on August 28, 2010 - 9:54am. Submitted by cynical on December 15, 2010 - 9:57am.